We did NOT work today! We arose at 0830, hours after our usual time, had a leisurely breakfast with the chickens, and took a drive that lasted the remainder of the day. It was BEAUTIFUL! We were followed by some rain as we drove south, but it didn't catch us until we turned the corner and took a shortcut through the island's center to return to the bungalow. Take a look. The trip started in Uturoa and headed south along the coast (and only) road. We returned to Uturoa via a shortcut through the mountains. 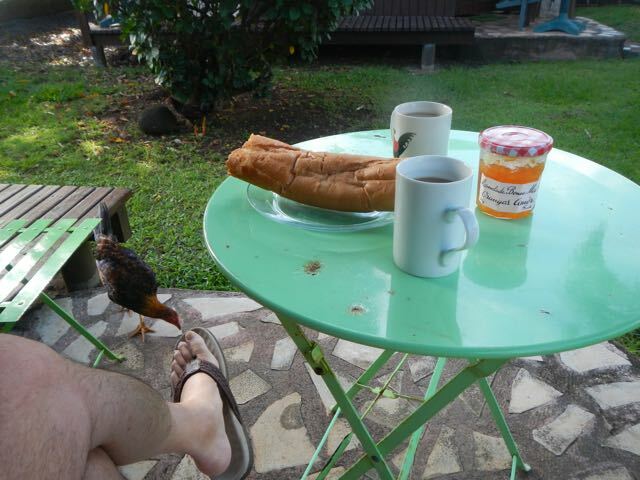 Yoghurt, baguette, orange marmalade, and coffee made a wonderful late breakfast for us. The chicken that appears to be pecking my toe is not, but they do stay around us just in case we feel generous or become clumsy. 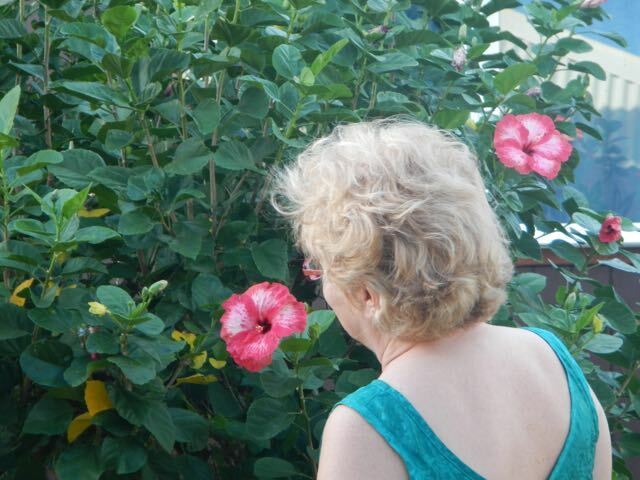 Lovely Conni examines the hibiscus growing in our little yard. The multicolored ones are not common to us. 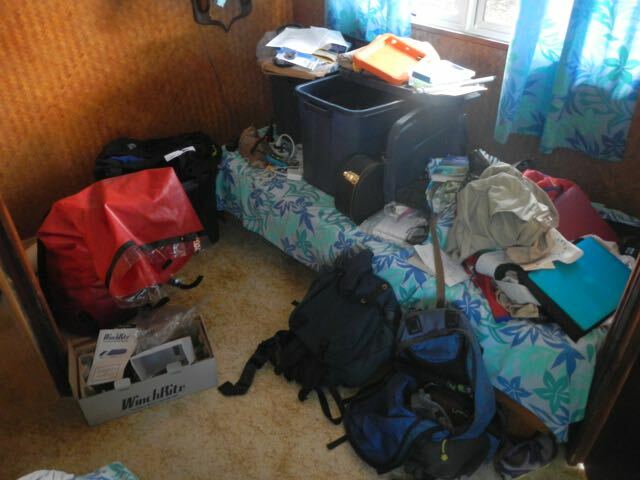 The inside of our bungalow shows how much gear we still have to take to the boat. We stick it all in the corner and deal with it as needed. There are three blue boxes, my Bill Bag, and lots else. The distant island with the COMPLETELY obvious shape is Bora Bora, of course, about 60 miles away. The near island is Taha'a. 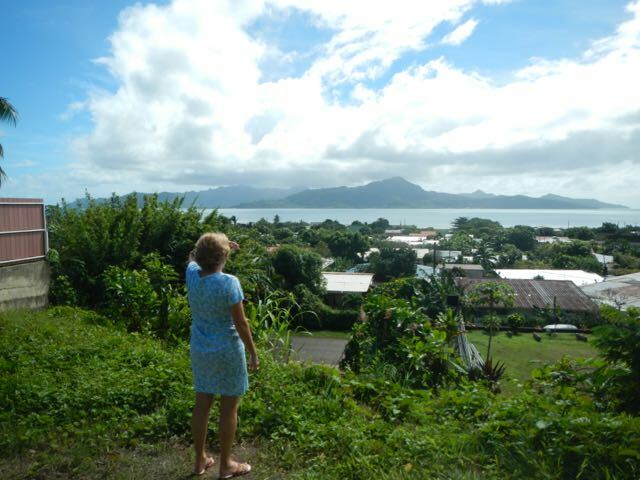 From a high point, Lovely Conni examines Taha'a, the sister island inside the same reef. 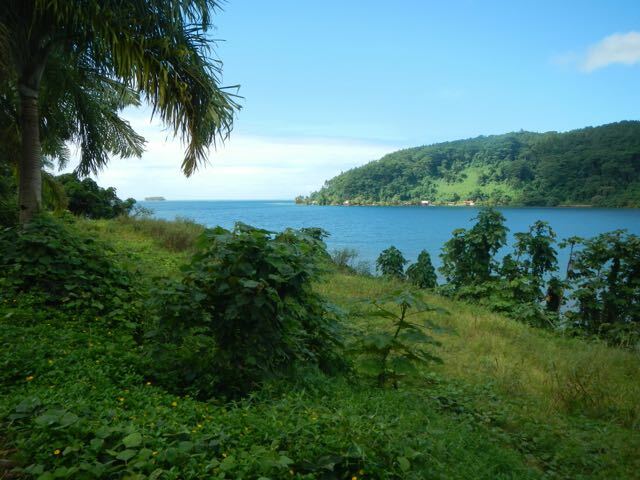 It's known as the "vanilla island" for all the vanilla plantations there. Many people actually commute between the islands via ferry. 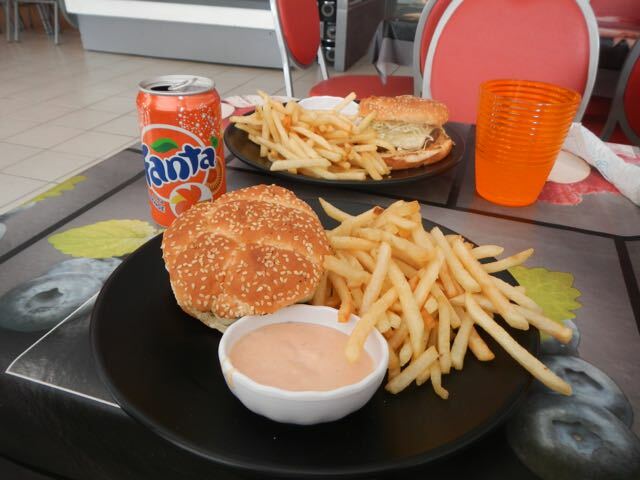 Tonton Burger was open! Amazingly, as drove by today, it was open. Sunday and not Friday? Yep. Still, it was a good burger and fries for a great price. We weren't ready for a meal, but felt obligated to eat there. The bowl contains what we believe is Thousand Islannd dressing, used to dip fries. 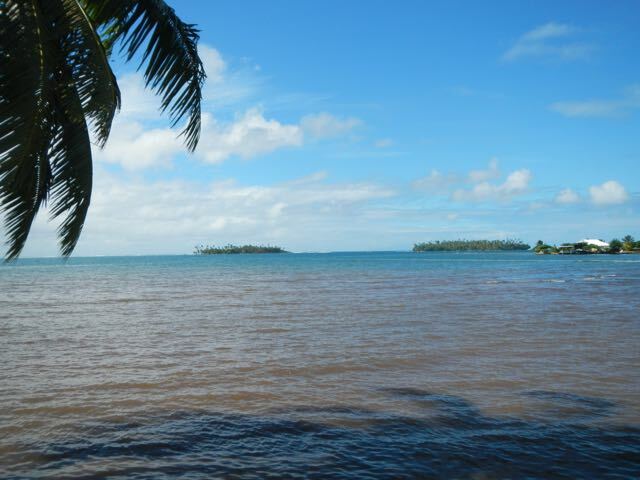 The open space between these two islands is the entry into the Raiatea lagoon through which we've traveled several times, now. We've just never see it from the land side! Faaroa Bay is the deepest bay in the Society Islands and it is spectacular. With depths over 100-feet, it's a rare and beautiful bay. We're looking seaward here. 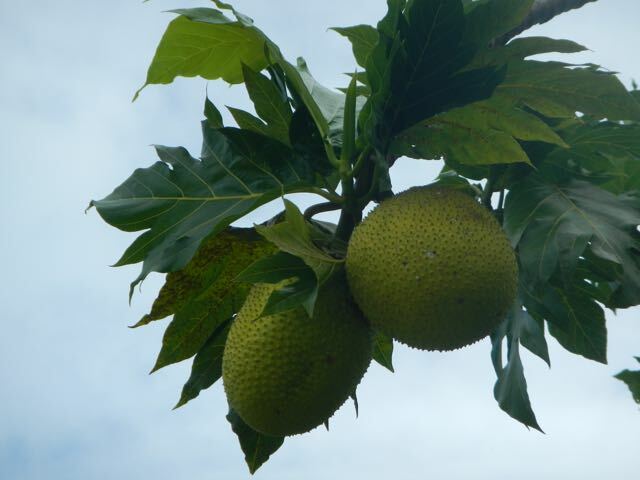 Breadfruit growing, something that we've rarely seen. As we mentioned, it's a major starch for locals, although they eat less these days. Breadfruit was the cause of the trip for the HMS Bounty that ended in mutiny. We've tried eating it several times but have not found anyone who's an expert in its preparation. 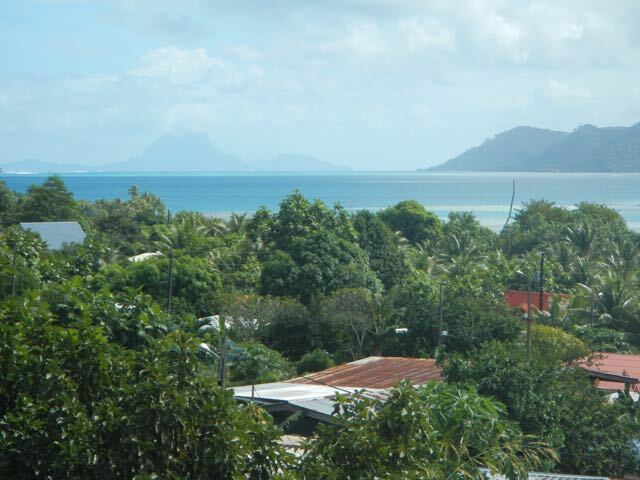 Raiatea (often called the Sacred Island) is the holy island of the Society Islands and Taputapuatea is the holiest location on the island. 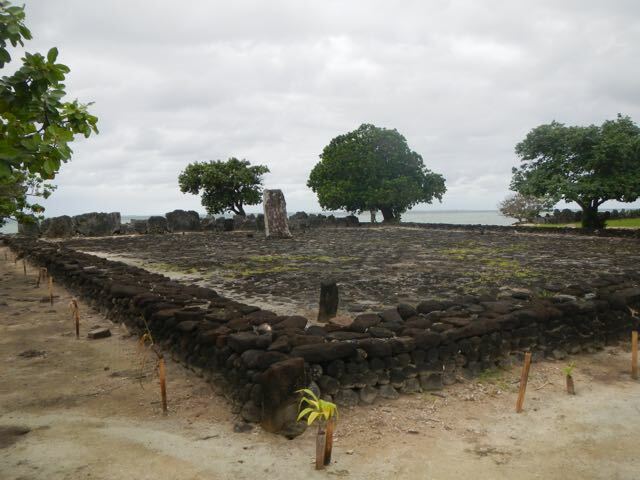 It was literally the spiritual and cultural center of the islands. As signage explained, it was on the border of several island groups and most of the larger religious uses of the marae (these stone structures) started with this one. The structure was already in use by 1000 but was greatly expanded in later years. 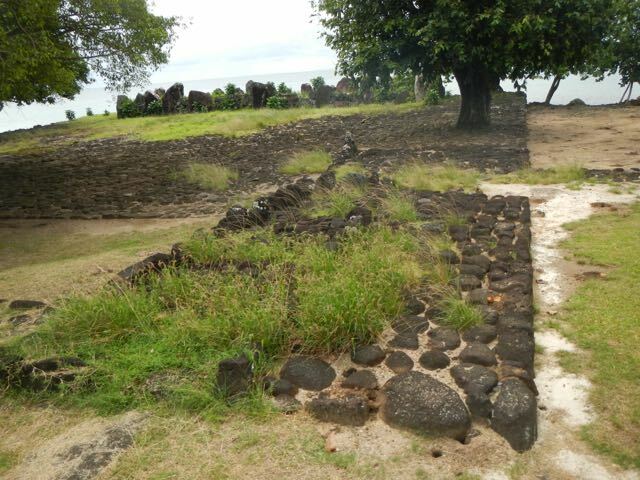 It is believed that the locals practiced human sacrifice on occasion, as well as ritual cannibalism. It's hauntingly beautiful even in such disrepair. 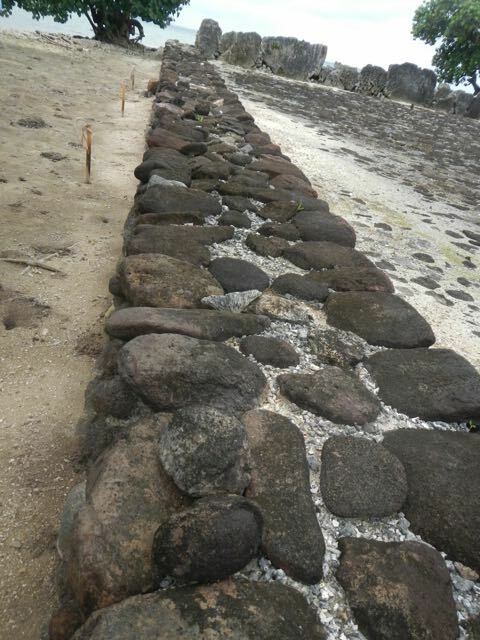 Legend has it that the voyaging canoes that found and settled Hawai'i and many other islands started at this location. Given its status, that's probable. Part of the marae is this lovely white sand beach. On a Sunday afternoon the locals use it heavily. The kid under the tree was listening to local Reggae. Traditions die hard. This alter is still a site used by locals and visitors, I suppose. The urge to add something is strong and we placed a rock on it. As Neils Bohr observed about a horseshoe, "one doesn't have to believe in it for it to work." There are some beautiful items here. 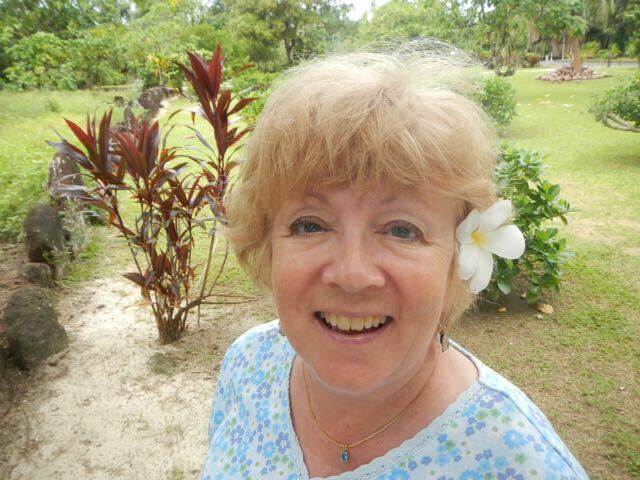 Lovely Conni found a tiaré flower to wear. She fits in here. Tiaré is a gardenia. A close-up of the many items that were given here. 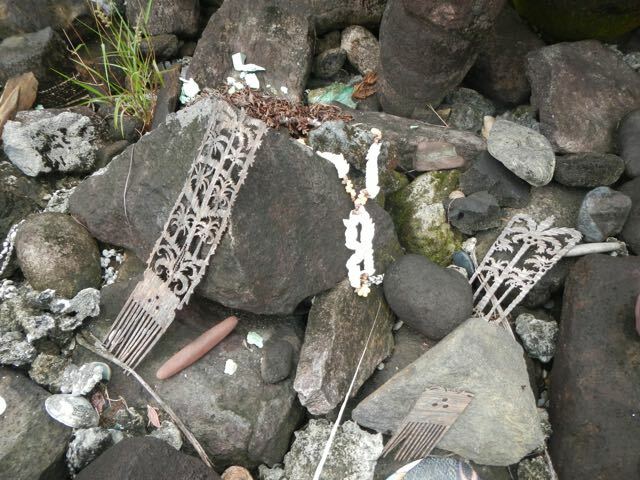 The intricately carved wooden combs were strikingly lovely. 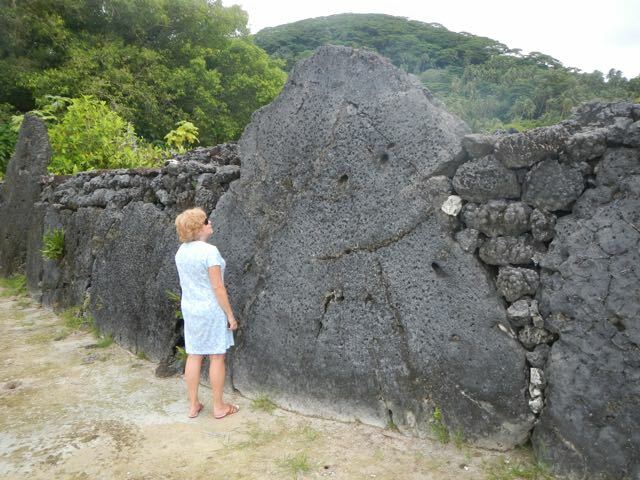 There were shells, carved rock, pottery, and much else, many with intrinsic value, some as simple as a stone. 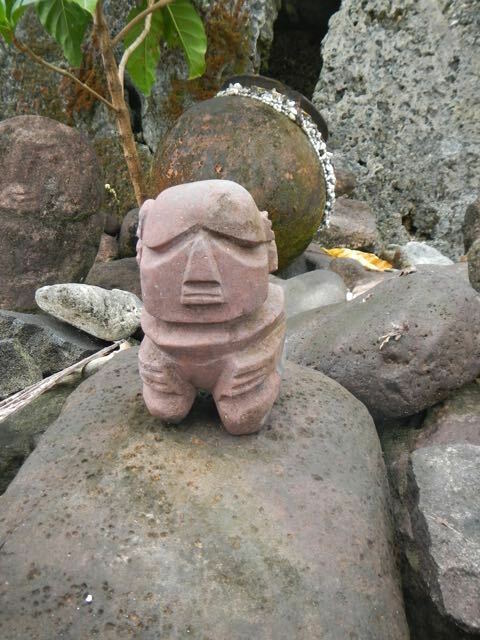 The figure at left is an "umu" or ceremonial carving. 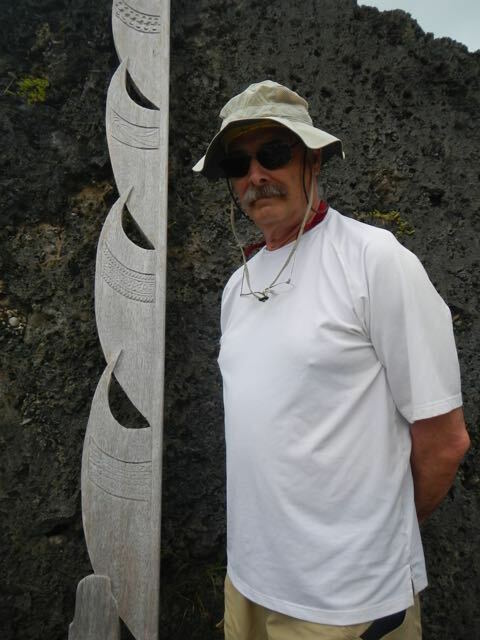 This one certainly represents ocean waves and stands about 10-feet tall. The carving is intricate and well executed. It was given as a gift and remains in the open air. A carving at the bottom showed that it had been given in 2010. The derelict at right simply wouldn't go away. The "holy of holies" at Taputapuatea, this is the main and most important marae/alter of them all. 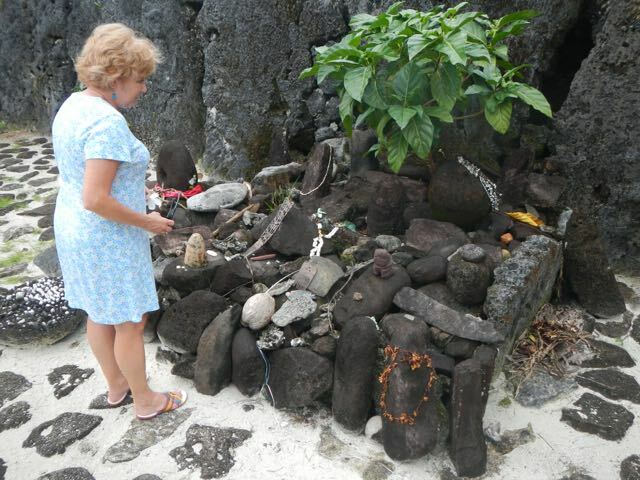 Note the large "alter stone" in the middle and the smaller tikis in various locations. I do not know, or even if it's known, what the name or purpose of the large stone is, but it's obviously the centerpiece of the marae. This is so square and well executed that the construction mystifies me. They had no metal, no wheels, no mathematics, no writing, none of the construction ideas that we'd use. Yeah, I know...lots of photos of the stonework. It astounds me that they thought of building in straight lines and right angles, and that they moved so much stone to construct these. How did they get such lovely lines and right angles? We'd use a 3-4-5 triangle, but they knew nothing of that idea. And how in the world did they move and handle this stone? It's many tons and they had no wheel. They did have log rollers, though, so perhaps that's how. Or it was the aliens again. 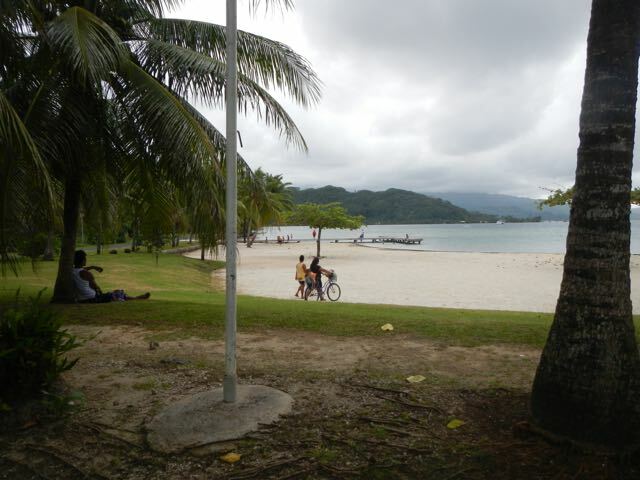 The Opoa Beach Hotel resides in its own little valley and beach. Conni has seen advertising for it and wanted to visit. 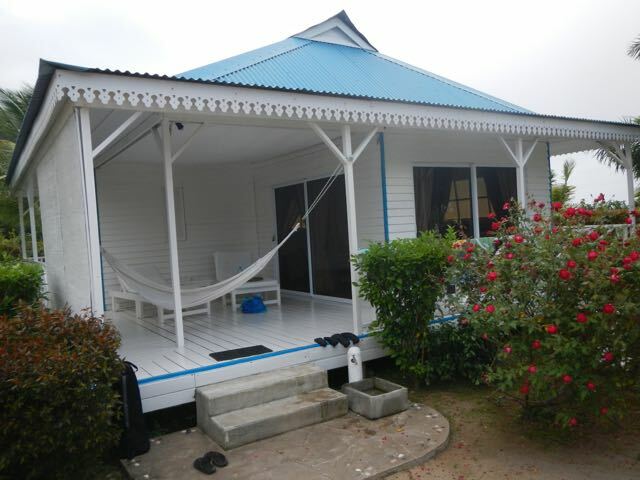 A garden bungalow is US$280/night, so not terrible. Word is that they have the best restaurant and cuisine on the island so we visited to try their cocktails. See the next image! 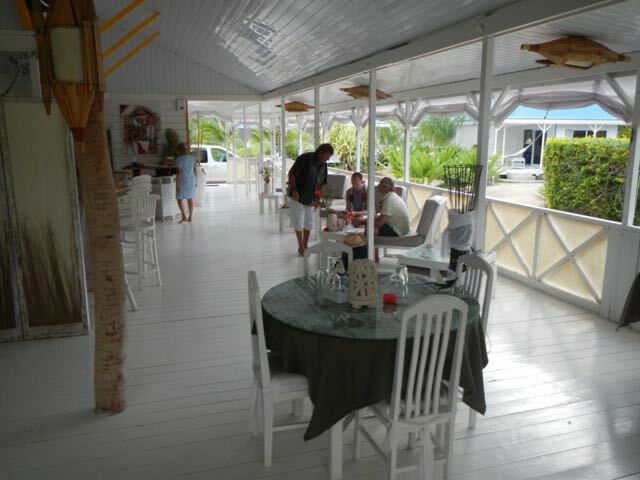 This is the bar/restaurant at Opoa Beach Hotel. Lovely, isn't it? Lovely Conni strolls along admiring the room at left. Wow! They tasted even better than they look! Hyacinth never looked so good! 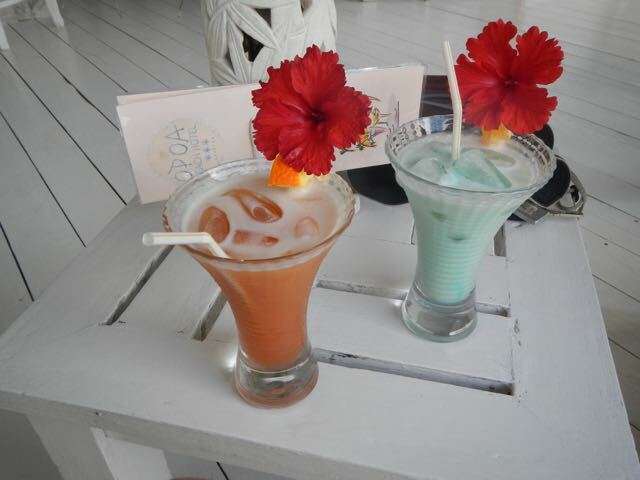 The left one is Planter's Punch for Bill, and at right is a L'Opoa, a speciality of the house, for Conni. This is what a tropical drink should look like. 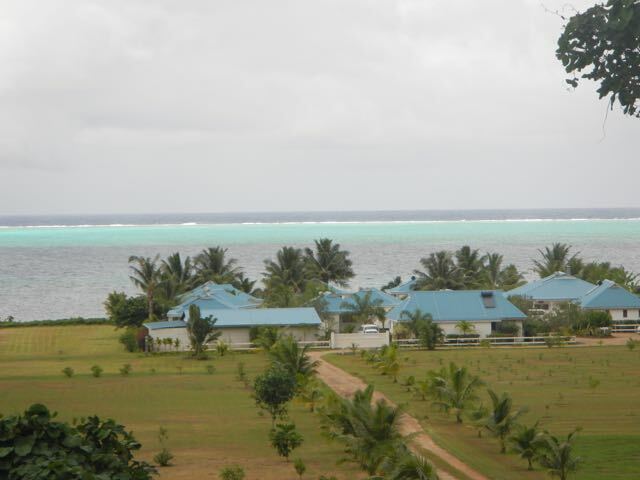 A bungalow at Opoa Beach Hotel is lovely and has it all. Many years of climbing creep out now and again and this gorgeous spire face spoke to both Conni and me. 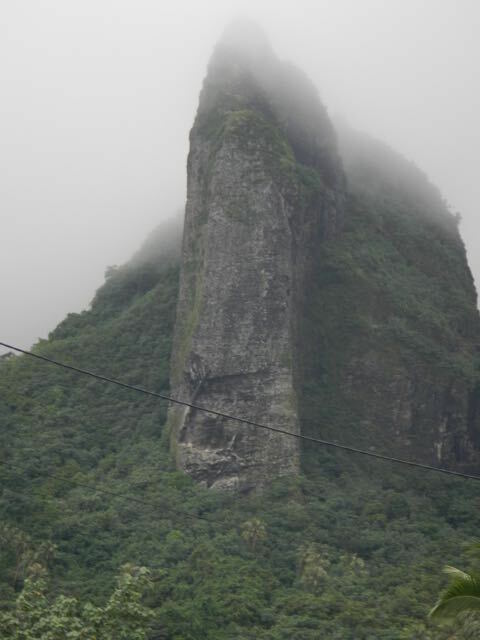 I couldn't find a place without a phone line to interfere, but the face was simply awe-inspiring. I'm sure that no boot has ever been on it. 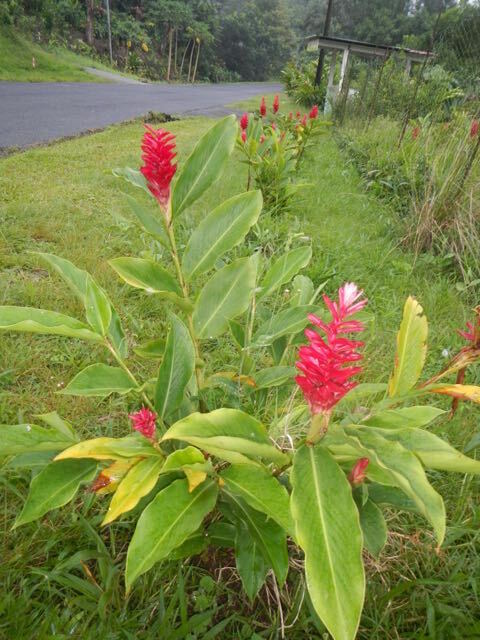 This is red ginger, a wildflower, and it just knocked me out. What color! When we found it in clumps with Croton, a varigated-leafed bush in various colors, there was, as Conni says, lots of "pop!"